The William & Mary Committee on Sustainability recently announced its spring 2018 Green Fee awards. A total of $74,466 will be dedicated to sustainability projects around campus, according to the committee. The Green Fee program began as a grassroots student initiative in 2008. Since then, it has funded more than $1 million worth of sustainability projects led by students, faculty and staff around W&M. This semester saw a wide variety of proposals, from campus-wide initiatives to innovative sustainability research projects. Some of this semester’s highlights included setting up more efficient LED parking lights, establishing electronic work processes to reduce paper waste and promoting water bottle filling stations. The Chesapeake Bay commercial blue crab fishery is responsible for 30 to 40 percent of the blue crabs that enter the United States seafood market. This predominantly trap fishery is negatively impacted by an estimated 87,000 derelict — lost or abandoned — traps thought to be present in Virginia waters of the Chesapeake Bay at any point. Derelict traps are responsible for negative economic and ecological impacts that affect the watermen’s well-being and other fisheries in the bay. Research results from a survey focused on determining Virginia watermen’s preferences for mitigation actions and incentives to address the issue of derelict traps will be used to promote a more sustainable and profitable blue crab fishery. Through outreach and education initiatives, this research will be used to inform W&M students, the general public, state resource managers and policymakers on mitigation actions and incentives most preferred by Virginia watermen to increase public awareness and support effective management actions for a more sustainable blue crab fishery. For almost 20 years, the VIMS Teaching Marsh has successfully promoted a culture of sustainability on campus by providing a low-maintenance landscape design with natural coastal habitats. Hundreds of visitors come each year to learn how they can implement similar practices at their own homes, schools, institutions and businesses. 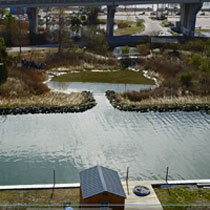 A green roof will be constructed and covered with living plants to reduce water runoff into the adjacent wetland demo nstrating what can be installed on similar roofs in coastal Virginia. A floating dock will be constructed that will improve access to the salt marsh pond for larger groups. A floating shed will demonstrate how buildings located in flood prone areas can be mounted on floats to withstand frequent tidal flooding. A new marsh camera will provide real-time observations of the Teaching Marsh on a VIMS website. The facilities management team creates, maintains and continuously improves the W&M physical environment to enable excellence in teaching, research and public service. Maintenance of buildings and grounds is an important part of that mission. Although a computerized maintenance management system supports the maintenance program, administering the work is still a very labor, travel and paper intensive process. Using electronic devices, primarily tablets, will streamline assignment of work, reduce travel and simplify data collection. In addition to increasing efficiency, incorporating these tablets into the maintenance process will reduce greenhouse gas emissions by approximately 3.6 metric tons per year and save 80 boxes of copier paper per year. The estimated savings over five years is nearly $200,000, which will be used to perform needed work throughout the campus. The Law School has metal halide lamps that will be replaced with LED fixtures to complete the conversion of the parking lot lights. W&M already specifies LED lighting for all new construction and has retrofitted a number of street lights with LED. This project will further its commitment to efficient exterior lighting and will provide a highly visible example for all those that visit the Law School. Currently, the Committee on Sustainability oversees three subcommittees that are furth er divided into several working groups. These working groups have minimal contact with each other and are generally very self-sufficient. 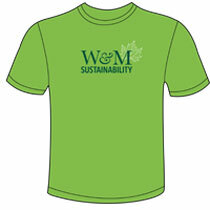 This funding provides for the creation and distribution of W&M sustainability shirts, which will be provided for free to members of these groups. The goal is to promote a feeling of connection among those involved in sustainability efforts on campus. When students wear these shirts on campus, it will be easy for members of different working groups to identify each other and possibly reach out to start a meaningful conversation. The John Clayton Chapter of the Virginia Native Plant Society will host the nonprofit’s annual meeting and conference on Sept. 14-16 at the W&M School of Education. The conference will offer an opportunity for W&M students who have an interest in sustainability and protecting the natural world to network with likeminded nonprofits and agencies and to highlight their sustainability work at the university. The green fee grant will sponsor at least 20 W&M students, allowing them to attend the conference at no cost. It is estimated that up to a billion birds die each year from building collisions in the U.S. alone. In particular, college campuses are a significant contributor to window collisions, and W&M is no exception. On a weekly basis, dead birds are found on campus around large buildings such as Kaplan Arena and the Integrated Science Center. Through this project, murals will be painted inside the windows of the ISC glass walkway. The murals will depict the science that goes on in the building — a fusion of art and science. The paintings will make the glass seem like a solid object and reduce collisions, while also giving students and faculty in the building a way to express their work through an art installation. In an ongoing effort to decrease disposable plastic bottle use at W&M, the Committee on Sustainability is partnering with student organization Take Back the Tap to fund the continued installation of new refillable water stations throughout the main campus and VIMS. This grant recognizes the high demand for these services, demonstrated by the multiple proposals submitted each semester by varying departments, offices and organizations. This funding makes quick strides towards the goal of at least one bottle filling station per high traffic building on campus, with strategic locations determined by COS, facilities management and TBTT. Upcoming locations include Bell Hall, ISC 1, Morton Hall, Parking Services/WMPD and Reves Hall. Branch Out alternative breaks is a student-led organization that offers immersive, service-learning experiences over school breaks through the Office of Community Engagement. The program is committed to teaching students how to apply what they learn on their alternative breaks through "ReOrientation," which encourages students to take skills from their trips and use them in Williamsburg. For many years, the group has had a team travel to Lynchburg Grows, a sustainable farm in Lynchburg, Virginia, that aims to combat food deserts and malnutrition in the region. The team requested Green Fee money to fund a Day of Service for students to see how food accessibility can be a problem in Williamsburg. Students partnered with Williamsburg Farmers Market to help conduct a state-wide research project to assess the impact of farmers markets on communities. Funding for this project provided students with the opportunity to practice sustainability in their local Williamsburg community, understand the community in which W&M resides from a sustainability and food-systems standpoint and further learn how each of them can create immeasurable positive sustainable change in the future.